The Nerf Super Soaker Electrostorm is one of the new models released for 2012 by Hasbro Inc. Though being the middle-in-size new model for 2012, the Nerf Super Soaker Electrostorm is only slightly larger than the Nerf Super Soaker Micro Burst. 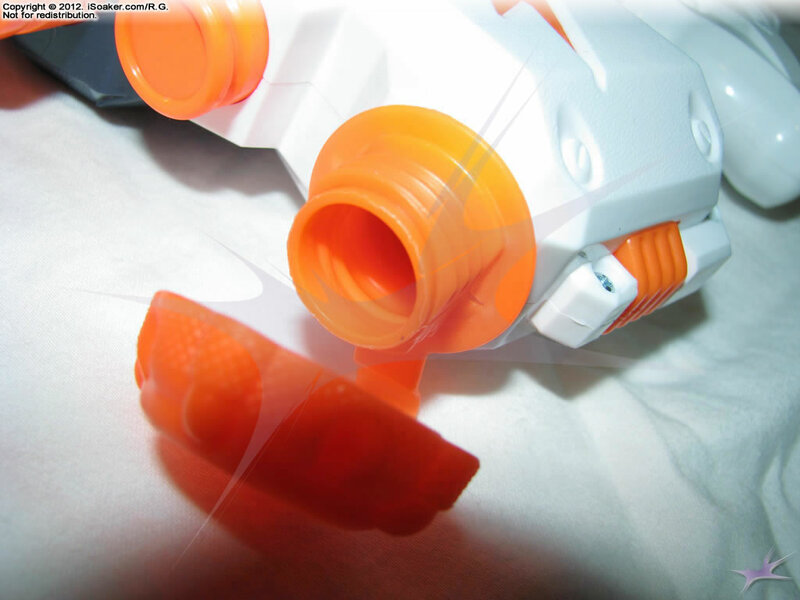 While looking at first like a smaller version of the 2011 Nerf Super Soaker Thunderstorm, the Nerf Super Soaker Electrostorm lacks the removable water magazine. Perhaps as expected being akin to the 2011 Nerf Super Soaker Thunderstorm, while it may be "Super Soaker" branded, its performance leaves much to be desired even for a motorized blaster. The Nerf Super Soaker Electrostorm features a rather small nozzle opening. Streams pushed out by this blaster are thin, indeed, and begin to break apart roughly 8 to 10 feet after exiting the nozzle. Output is, unsurprisingly, very low as well, being less than that of the 2011 Nerf Super Soaker Thunderstorm, though requiring just as many batteries to run the motor. The Nerf Super Soaker Point Break can definitely outperform this model and even offers more reservoir capacity. As already noted, the Nerf Super Soaker Electrostorm uses a motorized pump. The motor seems a little different than the 2011 Nerf Super Soaker Thunderstorm, but whether there is a true difference remains to be explored. It is powered by 4 AA batteries and activated simply by pulling the trigger; there is no on/off switch on the blaster, itself. 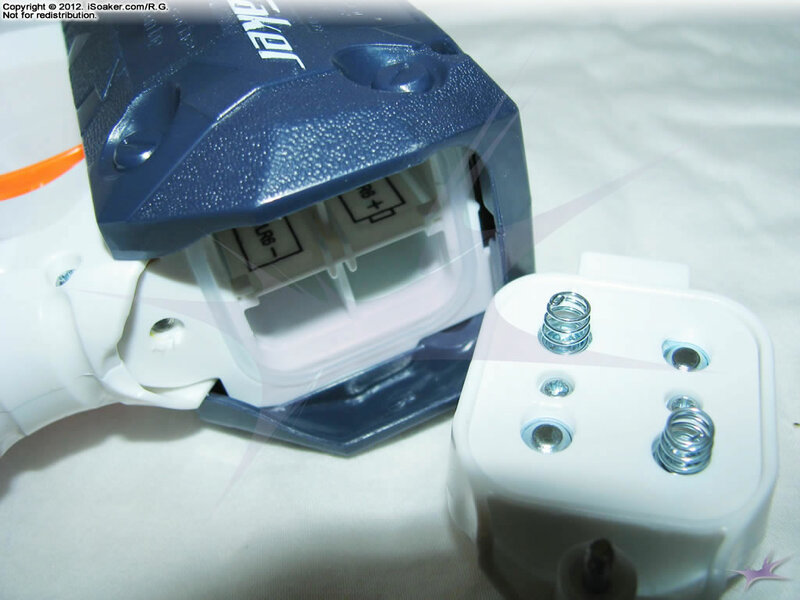 When activated, the pump is somewhat noisy and would definitely blow one's cover if one were previously hidden. There is also a slight lag between pulling the trigger and stream production. 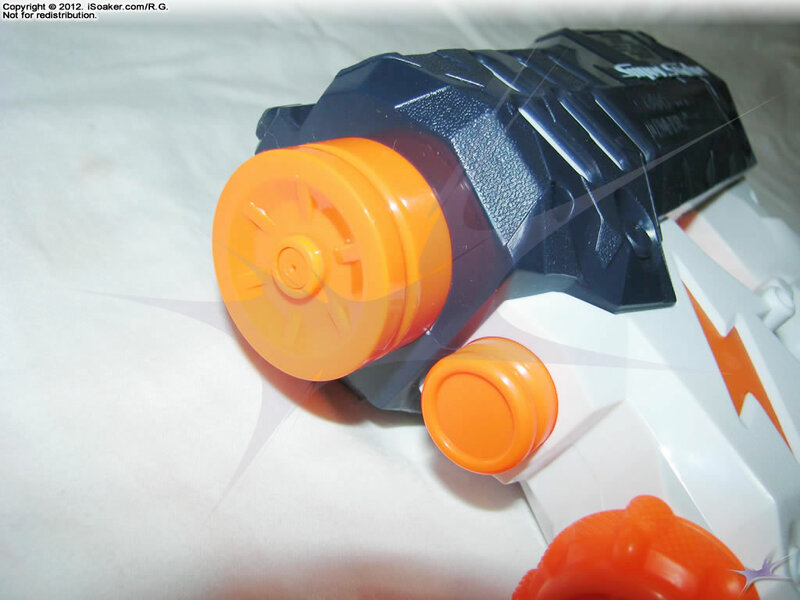 The pump is completely enclosed in the blaster's body and the battery chamber is sealed, though without any notable rubber gasket, making one wonder whether the electronics would dry during a serious water fight. It is definitely not recommendable to fully submerge this blaster. The Nerf Super Soaker Electrostorm's trigger and grip area, like the rest of the blaster, is well moulded and very comfortable to hold. It appears that Hasbro Inc. continues to make quality triggers and grips for the entire 2012 Nerf Super Soaker line. 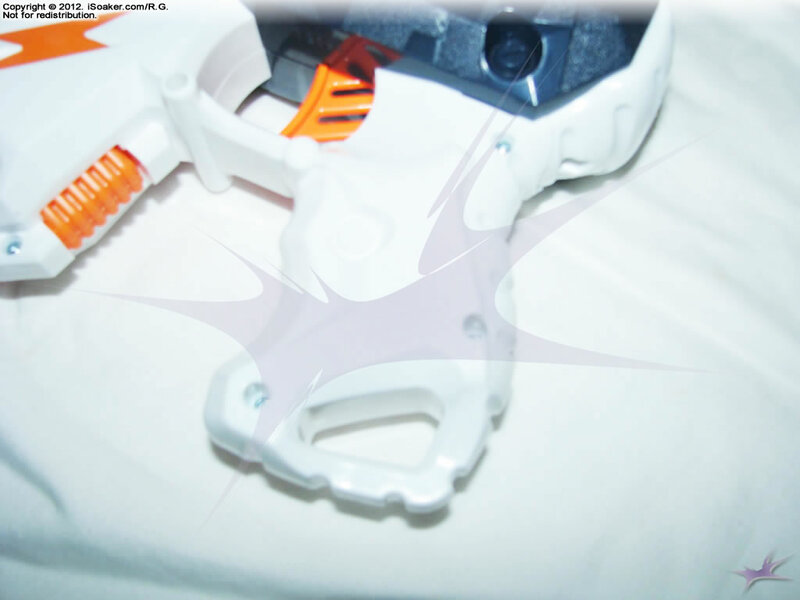 There even appears to be a place where a strap could be tethered through, though the blaster does not come with a strap. Unlike the 2011 Nerf Super Soaker Thunderstorm, the Nerf Super Soaker Electrostorm has no tactical rail. TheNerf Super Soaker Electrostorm features a forward-mounted fixed-capacity reservoir with a small screw-on cap. Due to the overall small profile of this blaster, the amount of water held in its limited reservoir is quite low, but thanks to this blaster's low output, it is still able to produce a continuous stream beyond 14 seconds. That said, even the small Nerf Super Soaker Point Break can hold two to three times more water in its reservoir than the Nerf Super Soaker Electrostorm can. As a whole, the Nerf Super Soaker Electrostorm is a well-built, nicely-styled water blaster, but lacking in power and capacity. Its usefulness in the water warfare field is severely hampered by its low range and output. Perhaps useful in very small battles, indoor fights, or for assassin-type games where a quick-draw water blaster is needed, the Nerf Super Soaker Electrostorm has very limited utility. Be wary if facing off against any true pressurized water blaster or any piston blaster of similar size or larger. Nice styling, sturdy build, and motorized pump. Output and range rather low even for a blaster of this size. Reservoir capacity low; no swappable magazine. Motor is rather noisy when activated. Requires 4AA batteries to work.